England is a nation of rich soccer history. Viewing itself as the home of the game, England finds itself 50 years removed from their last major championship. Will it be at the Euros in 2016? How will England hold up as it finds itself between two generations of players, the old and the new? Is manager Roy Hodgson going to be able to take the team to heights not seen since 1966? Or will the English narrative return to one of crushed ambition and broken soccer dreams? Those are the sorts of questions we are hoping to answer with our guide to England at the European Championships. Past, present, future; all are intersecting for England in 2016. How will that intersection resolve? Only this summer will tell. 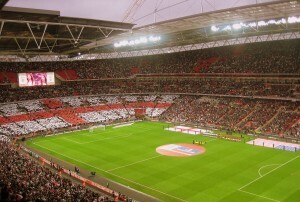 The English Narrative: What Defines the Home of Soccer? How to cite this article: “English National Team at the 2016 European Championship” Written by Seth Johnson and Stephen Kirchner (2016), European Cup 2016 Guide, Soccer Politics Blog, Duke University, http://sites.duke.edu/wcwp/tournament-guides/european-cup-2016-guide/english-national-team/ (accessed on (date)).